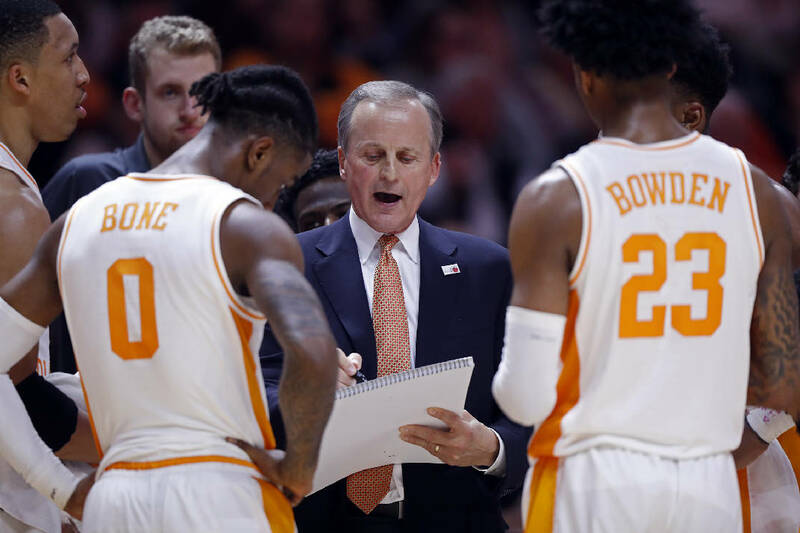 Tennessee men's basketball coach Rick Barnes, guards Jordan Bone and Jordan Bowden and the rest of the Vols will try to keep their emotions in check during the NCAA tournament, starting with Friday's game against Colgate. KNOXVILLE — The Tennessee Volunteers are a seasoned basketball team, and because of that they understand the importance of what's next on their schedule. The key for them, though, is to continue to stay as even-keeled as they have most of this season. Not getting too high. Not getting too low. Staying in the moment has been the Vols' approach, and save for Sunday's disappointing loss to Auburn in the Southeastern Conference tournament final, it's an approach they appear to have followed. The emotional high the Vols experienced after beating rival Kentucky 82-78 in the SEC semifinals last Saturday in Nashville may have been too much, though, because they followed it with a listless effort in the 84-64 loss to the Tigers. If the Vols (29-5) lose again this season, it will also be their last loss of the season. Their focus now, starting Friday afternoon against 15th-seeded Colgate (24-10) in the opening round of the NCAA tournament, will be doing what it takes to advance. Tennessee is a No. 2 seed for just the third time in program history but will try to avoid adding any pressure to a time of year that provides plenty of its own for college basketball teams. "That is a key," Tennessee coach Rick Barnes said Monday. "You just want the players to go in and play. We have played 34 games. We have been in a lot of hard-fought games where possessions are important. You don't have to play perfect. There won't be any perfect games played in this tournament. You go back, and in my lifetime, probably the closest one to perfection was when Villanova beat Georgetown (to win the 1985 national title). "You don't have to play perfect. Neither team has to play perfect to win. You have to be good, you have to be sound and minimize your mistakes and take care of the ball, not give up extra possessions and all those type of things. It is what you have played the whole year for, is to have a chance to go out and play this in this tournament." For the most part, the Vols have played like a relaxed team. There could be exceptions, such as their overtime win at Vanderbilt in late January. That was Tennessee's first game during a four-week run at No. 1 in the national rankings, but having that level of experience has also provided the team with a level of looseness. Losses appear to have come more because of bad matchups or decisions within the game, not because of being too tense heading into it. Junior forward Grant Williams, the back-to-back SEC men's basketball player of the year, is aware of the mental aspect required to succeed in the postseason. "That's part of what makes March so great," Williams said. "You can never be too high, you can never be too low. You have to keep that middle head, that level ground, because if you don't, you can be out. "That's where we've kind of grown. We've played a No. 1 team in the country (Gonzaga). Not many teams can say they've done that, and we prevailed. Sure, it's high emotion, but you can't let it lay over, because when you do that you start getting a high head and you can possibly lose your next game. Playing against talented teams every day in the SEC and playing against these guys every day, we understand, sure, you can have your fun and enjoy it, but you also have to understand that you have to move on to the next game and understand that as high as you were enjoying it, you can be feeling the same way the other team is the next game."